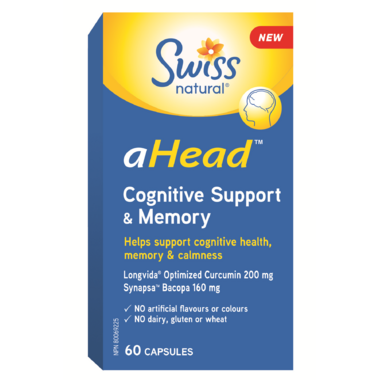 Swiss Natural aHead Cognitive Support & Memory helps to support cognitive health, improves memory and promotes calmness. Dosage: Adults take 2 capsules daily. Consult a healthcare practitioner prior to use if you are pregnant or breast-feeding; have gallstones or a bile duct obstruction; have stomach ulcers or excess stomach acid; have a bleeding disorder or if you are taking antiplatelet medication or blood thinners. May cause digestive problems. Hypersensitivity is known to occur, in which case, discontinue use.